Locations | Endo Manufacturing Co., Ltd. In order to produce both high quality and competitive products, we required an overseas manufacturing base and so we now have 3 subsidiaries and 3 plants in Thailand. This international division of labor system, which we started in 1989, has greatly supported our growth. 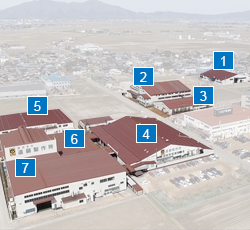 At our headquarters in the city of Tsubame, Niigata prefecture, we conduct sales, product development and the advanced technology development for each business segment, as well as management of the group as a whole. 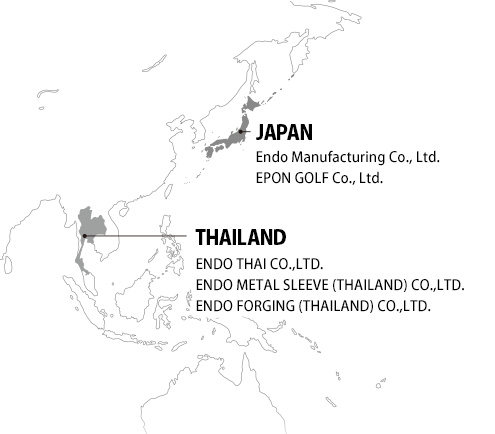 Epon Golf is Endo Manufacturing's own golf club head brand. We customize golf clubs in accordance with the requirements of each user, never compromising and always endeavoring to sell golf clubs with which each user will be satisfied. Our manufacturing base for golf club heads. To enable us to respond promptly to each customer's requirements, we manufacture heads under an integrated in-house production system that includes ENDO FORGING (forged golf club heads). 381 MOO 4 LADKRABANG INDUSTRIAL ESTATE EXPORT ZONE 3. CHALONGKRUNG RD., LAMPLATIEW, BANGKOK 10520, THAILAND. This is the manufacturing base for our metal sleeve products. Here we manufacture high quality products through an efficient production line and strict quality control. 179 MOO 7, GATEWAY INDUSTRIAL ESTATE, EXPORT ZONE, PLANGYAO DISTRICT, CHACHOENGSAO PROVINCE 24190, THAILAND. Manufacturing of forged automobile parts and forged golf club heads. 179/2 MOO 7, GATEWAY INDUSTRIAL ESTATE, GENERAL ZONE, HIGHWAY ROAD NO. 331, HUASAMRONG, PLANGYAO DISTRICT, CHACHOENGSAO PROVINCE 24190, THAILAND.